Life and Times of Alex Esguerra: Immigration,Religion and Faith on the Undocumented - "Migration Miracle"
" In her magnificent book, Migration Miracle, Jacqueline Hagan shows that religion has not consigned to the dustbin of history, but is vital and dynamic feature of contemporary social life. It constitutes essential reading for people interested in immigration and religion alike". - Douglas S. Massey, Princeton University. Last night as I open my News App on my phone and saw some of the recent days topics, I thought that this bestseller published in time when Barack Obama took office in 2008 was a good reference book at this time when anti-immigrant feelings are once again on the rise among Americans. It is a book casting economics and humanities towards immigration, the undocumented while exploring the harsh realities of the migrants desperate journeys especially from Mexico and Central America. The introduction pages starts with validating Central Americans and Mexicans comprising a sizeable proportion of the growing number of unauthorized entrants in the US borders each year. In 2000, the number rose to 850.000 a year from 500,000 in 1990. This book touches on while migrants do cross the border, some of their travels are very dangerous engaging with the desert heat and such. When in the US, the desperate journey continues in working at low wage jobs on manufacturing, construction and service industries. When the book was written it described on how these migrants earn about $21000 a little more than the poverty level. Today, as we know in a lot of states this income level is the poverty level. The book also described underlying researches on whether migrants make use of and rely more strongly on religion when they feel little control over the situations they are confronted with and when there is high risks. It looks about how Theology differences and local cultural practices may also influence the nature and extent to how these migrants uses their religious practices and beliefs in regards to the migration process. 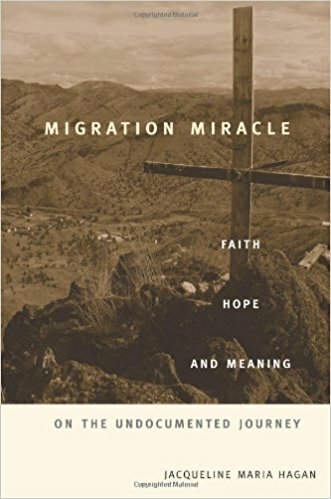 This book concludes on faith affirmation where at each stage of the migration process, many migrants practice familiar cultural and religious acts to cope with the "Traumas" of the "Undocumented Journey". If you haven't read this great book you should as the interrelation with religion indeed touches on being human regardless if he or she is undocumented. I will end this chapter by quoting from the book, "Faith and the construction and reproduction of familiar cultural and religious practices help many migrant believers not only endure their journeys but also face challenges and overcome misfortunes as they struggle forward in the United States".